At CloudAccess.net, we automatically run a daily backup of each site you have hosted with us. These automatic backups are stored offsite and are kept for 14 days. As an additional service, we've also created the "Manage Backups" feature within the Cloud Control Panel™(CCP) that enables CloudAccess.net clients to create their own backup that can be stored locally. The following article will explain how to use our manual Manage Backup feature. 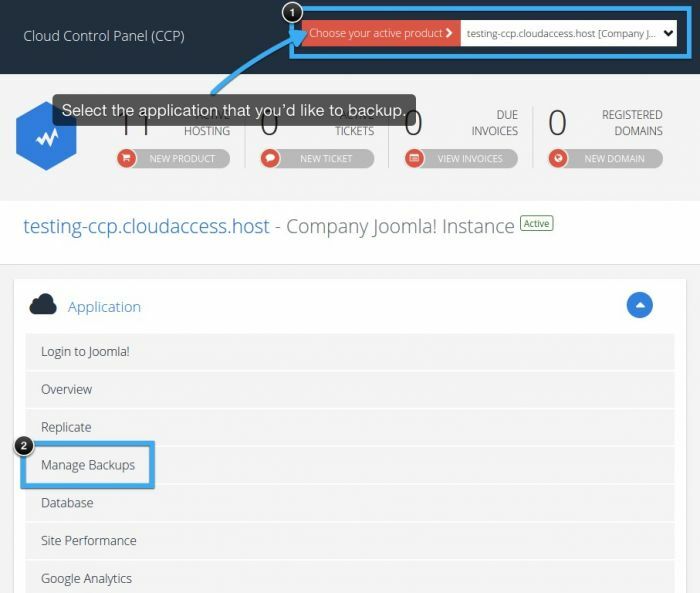 Log into your CCP to create a backup for each site hosted with CloudAccess.net. At the top of the CCP, select the site you'd like to work with. Next, click on "Manage Backups". In the "Manage Backups" area, click on the "Create Backup" button. A screen will display with the options for backup creation. 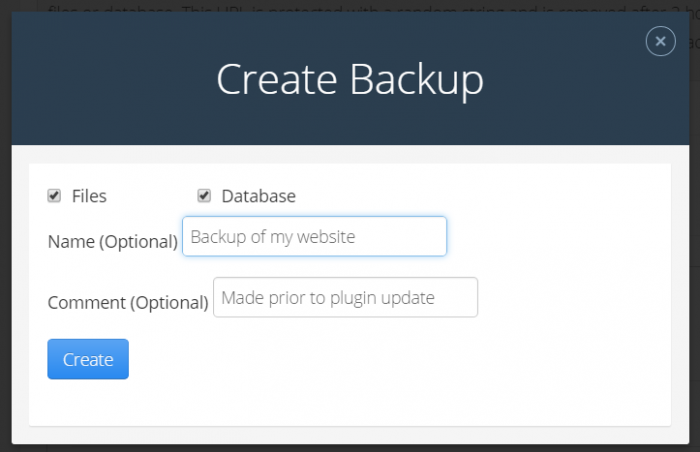 If you would like a full backup of your site, leave both Files and Database checked. You may then give your backup a name and comment if needed. When you are ready to proceed with the backup, click "Create". Wait while your backup is being created you will see the following screen. Please note that you are able to navigate away from this screen by clicking the "CCP" link. You will receive a message letting you know that you successfully created the backup. If you close that window, you'll see the backup listed with various options and details. To download a backup to your computer, simply click on the download links shown in the following image. Important: You must download both the files and database to have a copy of your entire site. You can also download your backups by accessing your site using file transfer protocol (FTP). Once you have logged in using FTP, open the backup folder, select the location on your computer where you would like to save the backup and then download the backup. Please note that you will have to download each backup separately. Restore to Alternate SIte - This is used when you want to restore a full backup to another paid site within your account. Restore Files - This overwrites the current site files with the file backup that was previously taken. This is not a common restoration method, but helpful in specific circumstances. Restore Database - This is also a partial restoration method that only overwrites the database. It's helpful in some cases, but should not be used for general site restorations. Once you restore your site from an older version, you will see a message letting you know that the restore is pending. Once the restore is complete, you'll receive a message you know the restore was successful.